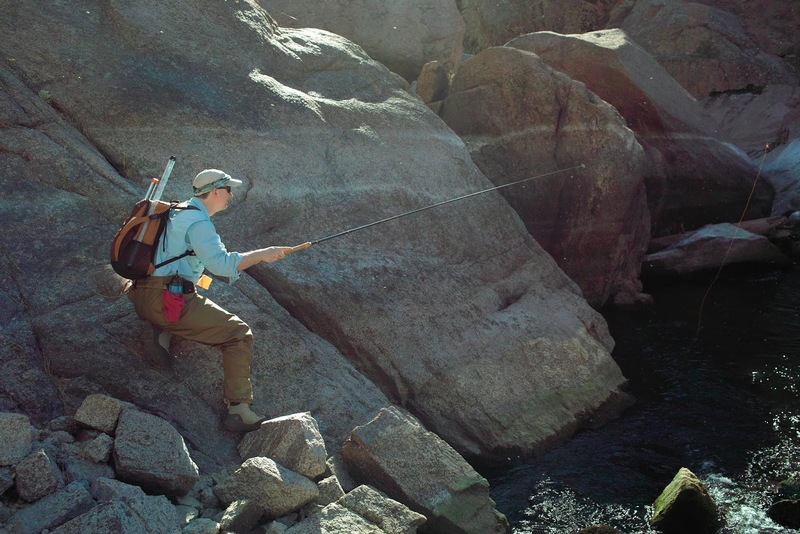 As a gear and particularly as a bag junkie I went through a lot of different packs during my fly fishing and tenkara career - side packs, over the shoulder packs, sling packs, chest packs, back packs etc. - you name it. I have two or three packs I like for fishing light, but I still have been looking for a pack for full day trips. The closest I was able to find that worked for me (other than just a plain backpack) was a sling pack but it was a bit too small; just by bringing my light weight rain jacket I would have used almost all space available. So, when going on day hikes and fishing "away from the car", i.e. when hiking-in a few miles before fishing, I packed everything I might need in a plain backpack which left me wishing I had my essential stuff (i.e. fly box or two, nippers, extra line etc.) not "back there" but handy upfront so that I wouldn't have take off the backpack and try to find what I need. This was especially not convenient when I was in the middle of a creek or river and had to wade back ashore to retrieve what I needed. This Fall I "rediscovered" Colorado based Fishpond (I own a very nice but not often used Fishpond fly fishing vest) and realized that some of their packs might be what I have been looking for - a combo of a fishing backpack and a chestpack. After a very nice email exchange inquiring what Fishpond would recommend for a tenkara angler, Fishpond was generous enough to send me their Piney Creek Tech Pack for review. The Piney Creek Tech Pack is one of three Chestpack/Backpack combinations Fishpond offers (there is a bigger Tundra Tech Pack and a smaller Double Haul Chest/Backpack. As mentioned above, the pack is a combination of a technical fly fishing backpack and the Tumbleweed Chestpack. Both the backpack and the chestpack can be used on their own but what is really cool is that the chestpack attaches to the backpack's straps in the front OR to the back of the backpack. This way you can decide how you want to be setup during the hiking portion and fishing portion of your trip. To my, it's obvious that it is more comfortable to have the chestpack attached in the back while "en route" to the creek of fishing spot and once there, you switch and attach it to the straps upfront so that you have all your fishing accessories handy. Dimensions: 10.5" x 7" x 19"
Dimensions: 5.5" x 3" x 9"
The volume of the backpack is plenty sufficient to hold anything I could need on a day-hike and probably even an overnighter (unless you camp out and need to pack a sleeping bag, tent, etc.) in a cabin and you need a change of undergarments after a hard day's fishing. On the few trips I took, I was able to pack my rain jacket, fleece jacket, first aid stuff, water bottle, extra fly boxes, fly lines, food/snacks etc. and still had room for more. There are many adjustment options and strap, almost too many for someone like me who never owned such a technical pack. It took a little time to figure out what the purpose of each strap is and how/when I should be using or adjusting it. But once I figured it out and overcame my own clumsiness, the backpack turned out to be very confortable and I barely noticed I wearing it, even after hours of fishing. An interesting feature for tenkara anglers that I would like to highlight are the zip-out rod tube holders. Obviously, this pack wasn't developed for tenkara but this feature is extremely valuable to tenkara anglers carrying multiple rods. Most backpacks have side pockets where folks usually store their water bottle or a rod. The zip-out rod tube holders are basically an extension to that side pocket, you open the zip and gain a few more inches of room and allowing the storage of your rod to be more secure from accidentally sliding out. The picture below should give you an idea how this works. Each side pocket is big enough to carry a total of 4 to 6 tenkara rods (4 if all your rods have cork handles, 6 if some of your rods feature no cork handles, i.e. like the Daiway Sagiri, Soyokaze or Kyose rods). Let's face it - the backpack will probably hold more stuff than you will ever need during a day's fishing. In the big compartment there is enough space for my rain jacket, a fleece, first aid kit, water, food, snacks, extra fly boxes, all my fly line spools, hat, glasses etc. The smaller compartment is still big enough for additional line spools, another fly box or two, a map etc. It holds everything you might need for a day trip into the back country and maybe even for an overnighter (well, that means a change of essential clothes if staying in a cabin, not a camp-out trip, the pack is obviously not big enough for a sleeping bag, tent etc.) There are a lot straps and adjustment options that make this a very comfortable backpack - once you figure out how what all those straps are for. Not having had much experience with technical packs and being a bit clumsy it took me a few dry runs at home before I figured it all out. One cool feature I would like to point out are to the tenkara angler are the zip-out rod tube holders. I know this pack was not designed for tenkara, but the tenkara angler will find those zip-out rod tube holders, one on each side at the bottom of the side pocket, are a great way to carry your tenkara rods. I was able to stuff them on each side with two traditional tenkara rods (with cork handles) and 3 "cork-less" tenkara rods (i.e. Daiwa Sagiri, Soyokaze, Kyose, etc.). That is a total of up to 6 rods!! 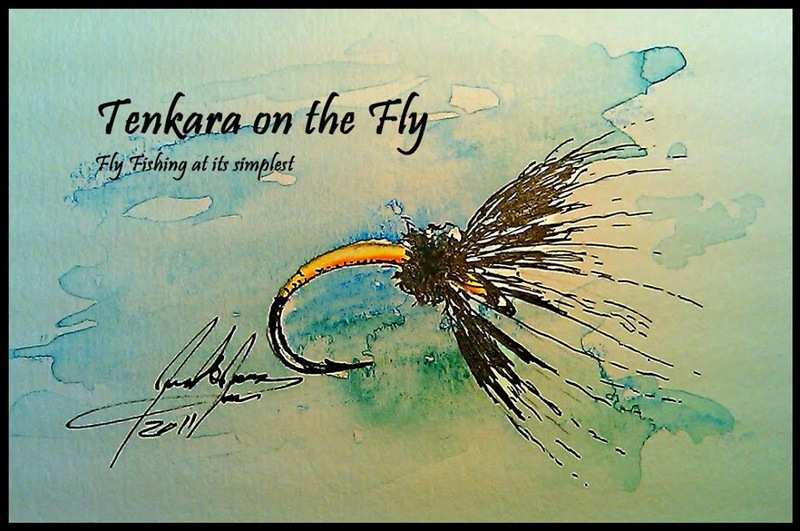 Being able to carry that many rods size of the backpack would make this a suitable bag for a tenkara guide or for the tenkara angler who wants to be ready for changing stream conditions and stream sizes or field test new tenkara rod models. The chestpack is just the right size. The front pocket can hold for the minimalist some flies in Fishpond's removable "fly bench" (basically a sheet with rows of closed cell foam, attached with velcro) or while removed, my custom made tenkara fly box (which is what I do). The main pocket holds for me another medium sized fly box, pocket knife, snack bars, one or two line spools and my fishing license. Forceps, nippers and other accessories can by attached in various places on various gear attachment tabs and loops. Of course the chestpack comes with a comfortable neck and waist strap so that you can use it without the backpack. front pocket of the chest pack with "fly bench"
The versatility of this pack makes it one of my favorites for my fishing needs. If I go up to RMNP for a day trip, I pack the backpack with what I need (and probably some stuff I don't need) and being able to attach the chestpack in the back makes for easy and comfortable hiking. Having the option of carrying a few rod choices safely is a bonus, especially should you break one far away from your home or car. It also allows to adopt to changing conditions on-stream should you need to break out that super short or super long rod. The chestpack is just the right size for smaller trips close to your car or if you are have only a few hours to go fish. Leaving the chestpack in your car would allow you to be ready to fish whenever you are close to water holding fish. Both the backpack and the combination is comfortable to wear and the only gripe I had was to figure out the straps and adjustment options (I blame myself for most of this issue since I tend to be a bit clumsy). The Piney Creek Tech Pack is available online and through your local fly shop that carries Fishpond gear. The prices as listed on Fishpond's website is $179.95. Disclaimer: I am not affiliated with Fishpond nor did I receive any compensation to review the Piney Creek Tech Pack. However, received it free of charge for testing & reviewing from Fishpond. Last but not least, I also would like to thank Kara who was very helpful in selecting the pack and coordinating the delivery of the pack.